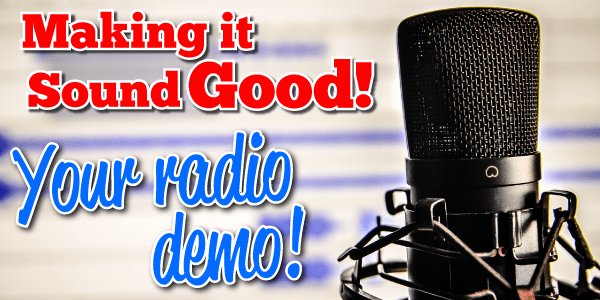 After spending 28 years presenting shows on radio stations in the UK here is my list of tips on how to compile the perfect radio demo tape otherwise known as a audition tape or showreel. Firstly listen to the station that you are sending the demo to. Listen to how the presenters are performing the links on that station. This should give you a pretty good idea as to how the programme controller likes his/her presenters to sound and what he/she expects to hear. The PC will be able to judge how you would fit in with their station and format if you follow in their style. Most jobs that will be available will start at a lowly position such as overnights so don't style a demo as a breakfast show as you're running before you can even walk. Analyse how the stations presenters deliver the links and do the same type/style on your demo. Each demo will be in a different style depending on the type and format of station that you are applying to. So for example a BBC local radio demo will be a different style to say a demo for Galaxy/Absolute. Use the stations name and any slogans they use as this shows you have listened to the station and crafted the audio specially and it's not just another generic tape banged out to 100 stations. Try and keep the demo short as programme controllers are very busy people, 3 minutes is more than enough. (somebody once sent me a demo that kicked off with the weather then three songs in a row and it lasted for both sides of the cassette! the tape went in the bin as they couldn't be bothered editing it and I couldn't be bothered listening to it) If the Programme Controller wants to hear more he'll invite you in or ask for more work to listen to. A PC is a professional who will be able to make a decision on your suitability within the first 30 seconds so use this time to make an impact. Make sure that your demo is professional sounding by recording it in a proper studio. A poorly recorded demo made in your bedroom with a £6.99 mic is not going to be received well. What is your audio trying to achieve? The idea of an audition tape is to sell yourself in under 5 minutes so make the first link on the tape your best so as to grab the PC's attention. Saying that I have known PC's who know this little trick and so purposefully fast forward into the demo before they start listening. So what about the music, jingles and effects? Get rid of all the music as they want to listen to you and not 30 seconds of Justin Beiber's new song play 3 seconds or less showing how you get in and out of tracks. Get rid of any name id's as this makes you sound very vain and again they want to listen to you not some jingle singers or butch voice over man. You can fade between the links, creatively mix if you're really good or use an effect such as a swoosh, zing, zap or static to cover the joins. The most important point is that they will be wanting to listen to you and not a mega over the top production. promoting a programme or event. etc. etc. This is not an exhaustive list and you don't have to do all these in your demo but you should include at least the weather and a Q card or script somewhere. The PC will be expecting you to be able to read scripts and deliver information at the right speed (i.e. not reading it at 500 miles an hour) and being coherent. Try to keep links short, one thought one link is enough, don't waffle. Don't try to copy the style of a presenter already on the PC's station. He's already got say a Steve Wright or Chris Moyles and will probably not want another one. Don't imitate, demonstrate. Finally be yourself, have your own style of presenting that fits in with the general overall style of the station that you are applying to. If you know other people in the industry play them your demo and ask for their thoughts. They might spot something that you haven't noticed or realised and you can get it fixed before sending it out. Be harsh with yourself and don't include anything you're not 100% happy with. Ask yourself have I shown I can do the basics? Have I shown I can cross promote? can I interview? can I sell competitions or promotions? have I promoted the station or shown interest in the music I'm playing. Once all the audio is in the can and you're happy with it it's time to send it off. Contact the station via their receptionist and ask for the name and contact details of the PC. Sometimes this informaton might be listed on the radio stations website. In the past it's always been a cassette or CD but today everybody has access to the internet so this may be the way you want to go. Check with the radio station if they know how the PC prefers to receive demo tapes. The options could be emailing your CV and an MP3 demo file or creating a website with some photos, career history and your demo. If you're emailing a file ensure that it is not a huge file attachement that needs to be downloaded. Other options can include creating a profile on Soundcloud, Audioboo or Mixcloud to load your demo on. Don't be too impatient as we have said PC's are busy people so give it a couple of weeks for them to get round to it. Follow up your demo with a phone call to see if they got your demo not that they listened to it. If you get no joy don't be disheartened PC's sometimes keep demos for when a job vacancy arises. It might be at this time that your demo will be listened to and decided upon. If you can talk to the PC ask for some feedback and some constructive criticism so you can give your next demo a better chance of success. A good time to contact a station is around September when the PC is starting to think about putting the Christmas schedules together. Make sure they know you would be free and available to work unsocial hours. Remember to keep your social media profiles such as Facebook and Twitter up to date as any prospective PC may perform a search to find out more about you. Posting lots of pictures of yourself drunk on a Saturday night is not going to make a good impression or make you look professional. If you are already working in hospital radio or community radio it's a good idea to always record your shows. There may be a few links you can reuse that will save you time making content. If you're on an internet station or community station say so in your covering letter or email. PC's know demos are the best bits and so love to eavesdrop to hear what you are really like at presenting on a day to day basis. Remember that demo tapes are not designed to get you a job they are there to get you noticed. A demo is a way to get you through the door to meet the PC who should be desperate to meet you. PC's are after two main things a good voice and a good personality.